By choosing and growing the right varieties of strawberries, under the right conditions, we can provide all our customers with delicious, high quality fruit throughout the season. Over the years, we have trialled many varieties to find those best suited to our south west coastal conditions - high rainfall with mild temperatures. 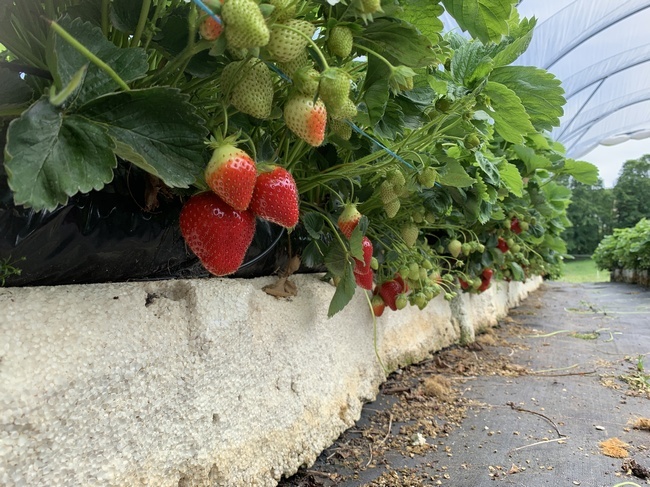 All our covered strawberries are now grown in bags on table tops, which makes picking easier and provides better ventilation and easier plant management. We buy certified plants from specialist propagators around the UK, with the majority coming from Norfolk, where fenland peat ensures the highest quality. We have also sourced plant material from Spain, South America, Holland, France and the USA. Our next crops is Honeoye, which provides bright, shiny, good quality fruit. We plant these in early spring and cover them with fleece in March/ April to bring the first harvest forward by a week or two. The harvest overlaps with the start of our outdoor crop - Symphony. Symphony has bright glossy berries with an excellent shelf life and is our main season crop. The harvest is staggered by planting through black plastic to bring them on early. White plastic is used for the main season. Some are covered with straw in February, which we remove in May to delay the crop. Symphony are planted in September time as bare root plants and will stay in place to give three seasons of fruit. The Everbearer (autumn fruiting varieties) begin cropping outdoors at the end of July and continue into October. They are planted in the spring and produce an abundance of fruit, but for one season only. The two varieties we grow are Everest and Everglades, which both bear large, attractive, firm berries. From September to November, we harvest both Everbearers in tunnels and Eslanta under Spanish tunnels. The Everbearers for late cropping are planted in July. The late Elsanta are also planted in July and remain in place for the first crop indoors, the following year. The origin of the English name 'strawberry' is something of a mystery. It may refer to the plants straying runners, or to the tiny straw-like seeds found on the fruit. It is unlikely to refer to the laying of straw under the plants to protect the fruit. In Teutonic legend, the strawberry was sacred to the goddess Frigga, principal wife of Odin. As goddess of the clouds and of married love, she ruled all housewives and is often depicted with housekeeper's keys dangling from her girdle. It was said that she stole children who had cried, concealed them in strawberries, then sent them, packaged in the fruit, on clouds up to heaven. Many fairy tales involve the gathering of strawberries, often out of season, when danger lurks in the winter snows. Strawberries were cultivated by the Romans as early as 200 BC. In the reign of the Holy Roman Emperor Charles II (823 -877 AD), the coat of arms of Simon, Lord Fraser of Lovat featured five strawberry flowers arranged in the form of a St Andrews cross. Above his shield appear 'strawberry leves a lacing argent'. The Lovats' motto, 'Je suis prest' (I am ready) applies perfectly to a ripe strawberry! In medieval times, strawberries were regarded as an aphrodisiac and a soup made of strawberries, borage and soured cream was traditionally served to newly-weds at their wedding breakfast. In the sixteenth century, strawberries were sold in cone-shaped straw baskets, making them one of the earliest packaged foods! In the late 19th century, strawberries were being grown on the outskirts of London and transported into Covent Garden by women who had begun harvesting at daybreak. The fruit was put into baskets weighing 30 -40 lbs and then placed on top of a cushion on the women's heads for 'jogging' into market. Variety testing and breeding began 200 years ago. The father of the modern strawberry was Thomas Laxton who, in 1892, crowned his efforts with the justly named Royal Sovereign, which held its own in the market place well into the 20th century. Royal Sovereign was the variety grown by Boddington's when we first began. Sliced strawberries, very lightly dusted in muscavado sugar, then gently fried in unsalted butter. Serve over ice cream, as a filling for pancakes, or as a topping for waffles. Strawberries blended with banana and ice cold milk. We all know about strawberries and cream, but have you tried cream and strawberries? Whip double cream until it peaks, then gently fold in strawberries, top with a sprinkle of brown sugar and add a sprig of mint for a fabulous desert. And for complete indulgence; try floating a strawberry or two in your next glass of champagne! You might like to try these other delicious recipes - along with some more unusual applications! 200g bag of pink and white marshmallows, roughly snipped. 1. Combine the strawberries almonds and chocolate in a bowl. 2. Stir in the snipped marshmallows a few at a time. 3. Add the ice cream and stir until evenly mixed. 4. Return to the freezer for 30-45 minutes until hardened. 5. Leave to cool, then lift the caramel and break into shards. 6. Combine the cream, mint and chopped strawberries. 7. Mound the cream and meringues into a serving bowl, and add the whole strawberries, a few at a time. 8. Finally, stick the sugar shards into the desert bowl and serve. Strawberry bread was commonly baked by the Indians of North America. Any modern recipe for skillet or griddle cakes, or for soda bread, will serve as a basis for strawberry bread. Simply mash the strawberries, without adding sugar, add to the bread mixture and bake in the normal way. Fantastic! Hull the strawberries, put the fruit into a preserving pan with the lemon juice. Heat the mixture gently and stir constantly until the fruit is soft. Add warmed sugar, stir and boil until the setting point has been reached. Remove any white froth and allow the jam to cool. Pour the jam into warmed jars. Makes about 5kg. For mild sunburn, take a few fresh strawberries and rub over the affected area. Leave the juice on for at least half an hour, then wash it off with warm water. With their high vitamin C content, strawberries are ideal for softening and nourishing the skin. The pH acidity of the strawberry is almost exactly the same as that of the skin itself. So, extract the juice from some fresh strawberries and add a little warmed milk. Apply to your face and leave overnight, or at least, for a few hours. Then rinse off with rose water for a beautiful complexion!